We just found out our dates for our summer trip to CROOKED CREEK RANCH Young Life resort in Colorado. Make sure you don't schedule a family vacation or sports camp during JUNE 19th-29th. Spots are limited. Download the Registration Form, print it off, fill it out and give to a Young Life leader ASAP! $100 is all you need to reserve your spot. Payments can be made throughout the year! It makes a great Christmas gift! 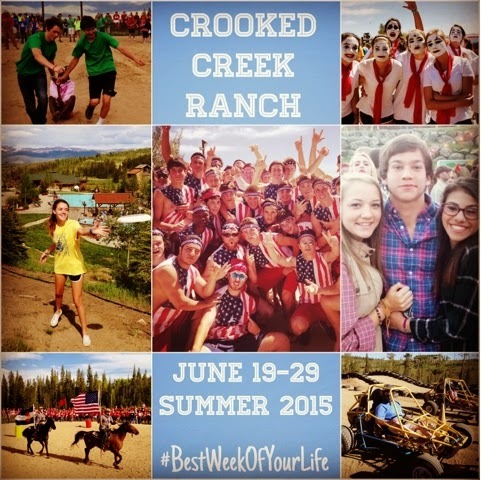 Here's a 3 minute video showing you why Crooked Creek is sooooo amazing! Young Life's Crooked Creek Ranch - Summer from Sean Anthony Conlon on Vimeo. The cost is crazy expensive, but it's so worth it for one of the best weeks of your life. Last year NW students fundraised over $5000. A few students raised EVERY PENNY. It's $950, but you can sign up with a $100 deposit and start fundraising today. We leave in 33 weeks (233 days). After you pay the $100 deposit, it's basically raising $25/week until we go. You can do that. We as your leaders would love to help you. Money has NEVER stopped anyone from experiencing this life changing week in Colorado! We're selling Krispy Kreme buy one dozen, get one dozen free cards. You get 10 dozen dougnuts free! The card is valued at $80 and only costs us $8. We sell them for $20 (cheaper than buying 2 dozen), making $12/card profit. Last year our family personally bought 2 cards and they never expire! Sell 16 cards and make over $200! Every spring we have a YL breakfast at Applebees on Battleground. Kids sell tickets to anyone for $7 and make $5 for each ticket. Invite 4 families of 5 and make another $100. We have lots of friends who want to help kids go to camp and pay well for hourly work. Let us know if you want to work and we'll help find folks to hire you. Now is also a good time of year to rake leaves and clean gutters. Ask your neighbors if you can clean their gutters for a $ donation towards your summer camp. Work odd jobs for 20 hours and make $$300. We do a trash-a-thon in May where we pick up trash off the streets. Kids get sponsors per bag of trash. Get your grandmother, uncle, and 2 family friends to each sponsor you $5/bag. Pick up 10 bags of trash and that's another $200. It can add up fast. AND there will be some scholarship $. Don't let money stop you, we'll help you get there!